In November of every year, the Pirates and the Privateers invade St. Augustine once again, giving you a great chance to bring your whole family for a fun and educational weekend. It all starts on Friday morning at 9am, when the Pirate Encampment is open for student tours. This is a great way to introduce history to your kids!. We met several Pirates and their Ladies, their camp setup, weapons, tools, and everyday things that they used in the 1700's. The pirates that we met introduced us to some interesting navigational instruments, and learned a little about how the navigational expert on board was so important. We learned about the meaning behind the pirate flags, and the meaning of the skull and crossbones symbol. The pirates shared with us some skillfully crafted knives and swords, and learned all about the guns,and how they worked. A sword fight broke out, in the midst of all the festivities, and we were treated to some fine swordsmanship! Whitney Laboratory, out of Marineland, Florida,had a station set up, and shared with visitors many different kinds of living sea creatures that they brought with them. This was a special treat! 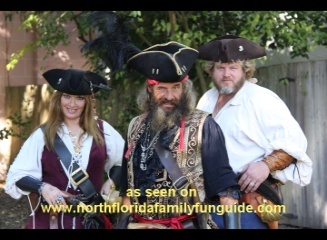 Saturday and Sunday of the Pirate Gathering is filled with revelry throughout the City of St. Augustine Florida. Many activities are hosted at St. Francis Field, and others are hosted right on St. George Street. Check their website for details! We had fun, and it was so worth playing hooky from preschool for Bryan! I bought him a pirate flag and a hat on the way out, and a pirate lady that caught his eye, gave him a dubloon for him to treasure forever! Thank you Pirates, it was much fun, hope to see you next year in November!